251. The design of the cap badge is an eight-pointed diamond cut star; upon the star a raised circle surmounted by the crown; within the raised circle, the block letters "VRI", the Imperial Cypher of Queen Victoria. Non-commissioned officers and men - (Plate 1 (b)) - The star in white metal, remainder of the badge in brass. 253. The badge will be centred on the front of the cap so that the lowest point of the star is just touching the upper edge of the chin strap. 254. 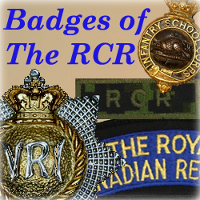 The design of the collar badge is the Canadian beaver on a ground; below a scroll bearing the motto "Pro Patria". (See Plate 1 (c) - Officers and Warrant Officers Class 1; Plate 1 (d) - All other ranks). 255. 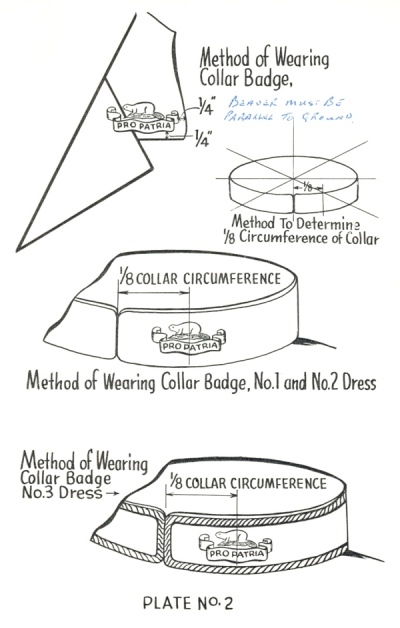 The following types of collar badges are worn by members of The Regiment. c. Brass - height 9/16 inch, width 1 7/16 inch - by all other ranks on patrol jacket, summer service dress and greatcoat. (Plate 1 g.). The title will be centred flat on the shoulder strap with bottom touching base of strap. d. Cloth - on a blue background with a 1/8 inch black border, the words "THE ROYAL CANADIAN REGIMENT" in gold letters 3/8 inch in height. Dimensions - height 1 1/2 inch, width 5 inches. Worn by all ranks on battledress and armlet. The title will be machine sewn on the battledress even with the shoulder seam, with the letter "R" in the word "ROYAL" centrally positioned. 257. 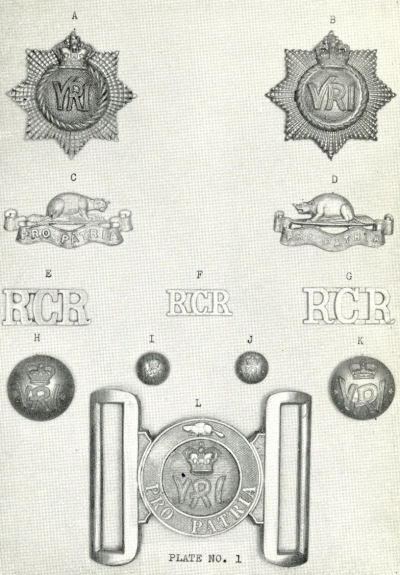 All buttons will bear the Imperial Cypher (VRI) surmounted by a crown as shown in Plate 1 - Officers and Warrant Officers Class I (Plate 1 h. and i. ), Warrant Officers Class II and below (Plate 1 j. and k.). Officers and Warrant Officers Class I only, will wear gilt metal; all other ranks will wear brass. 3 - 26 ligne 5/8"
a. By Officers and Warrant Officers Class I on breast pockets, cuffs, shoulder straps of patrol dress. b. By Officers and Warrant Officers Class I on shoulder strap, pockets of service dress and tropical worsted. c. By all ranks on the cuff of the blazer. d. Shoulder straps of the mess kit, and cuffs of No. 3 (c) order of dress. 4 - 30 ligne 6/8"
a. By all ranks down the front of the patrol dress. b. By all ranks on the shoulder strap of greatcoat. c. By all ranks down the front of the blazer. d. By Warrant Officers Class II and below on breast pockets of the tropical worsted. 5 - 36 ligne 7/8"
a. By Officers and Warrant Officers Class I down the front of the service dress. b. By all ranks down the front of the summer service dress. c. By Officers and Warrant Officers Class I on the belt of the greatcoat. By all ranks down the front of the greattcoat. 260. Regimental blue single cord lanyard 33 1/2 inches in length, with a loop at each end, will be worn on the left shoulder of Nummbers 6 and 7 orders of dress by all Officers, Warrant Officers and Non-Commissioned Officers, with whistle attached. Method of wearring is to have the end with the loop pass under the arm, the end with the snap fastener over the shoulder, then through the loop into the pocket close to the armpit. 261. Badges of rank of Warrant Officers and below - Good Connduct, Marksman Specialist and Tradesman badges are worn in accordance with diagram shown at Plate 3. 262. Ribbons and para wings are worn in accordance with diagrams shown at Plate 4.
a. Cloth Ordnance Pattern - by all ranks on Numbers 4, 5, 6 and 7 orders of dress and para jackets. b. Large silver embroidered wings mounted on black backing - by all ranks on Numbers 1 and 2 orders of dress. c. Small silver embroidered wings mounted on scarlet backking - by Officers and Warrant Officers Class I on Number 3 order of dress. 264. Officers and Warrant Officers Class I will wear their medals, including miniatures, court mounted. The minimum number of medals or miniatures for court mounting will be two. Court mounting will be done in such a manner as to permit cleaning or polishing of medals or miniatures. All other ranks will wear medals loose mounted. 265. Officer's swagger sticks will be a dark malacca cane with a silver ferrule and knob. The Regimental Crest will be mounted centrally on the top of the ball knob. When the stick is placed or carried under the left arm the ferrule will be to the front. 266. The regimental swagger sticks will be 26 inches in overall length, a dark malacca cane with a white metal ferrule and knob. The regimental cap badge 7/8 inch in size will be embossed centrally on the knob. The knob will be 1 3/4 inches in length, the ferrule 3/4 inch. The stick will be carried by Junior Non-Commissioned Officers. 267. All Warrant Officers will carry regulation ordnance pattern pace sticks unless otherwise ordered. 268. All Senior Non-Commissioned Officers will carry a drill cane which will be sand coloured malacca, approximately 1 inch in diameter and 36 inches long with a white metal ferrule and knob. Reproduction of the cap badge on the knob will be 7/8 inch in diammeter. The ferrule will be 1 inch in length and the knob 2 1/2 inches. The cane will be 1 inch in diameter at the knob and taper to 3/4 inch at the ferrule. 269. The regimental sealed pattern (silk) tie will be worn with the blazer. All ranks are permitted to wear the regimental tie with civilian clothes. 270. The regimental sealed pattern scarf (silk) of the same design as the regimental tie may be worn by all ranks with civilian clothes. 271. The Regimental sealed pattern locket will be worn by all ranks with 37 pattern web belt and by Warrant Officers Class II with sword sling belts. 272. The locket worn by Sr NCO's and below will be a brass two piece locket type buckle, left piece (female) stippled finish, with the word PRO PATRIA at the bottom and the beaver couchant at the top, right piece (male) of grained finish with the Imperial Cypher (VRI) in the centre surmounted by a crown. 273. Officers and Warrant Officers will wear a locket as described in para 272 above with the following exceptions: the male piece will be of plain polished brass and a silver Imperial Cypher (VRI) % inch in height mounted below the crown.